Sometimes when you buy eyeglass chains, it's difficult to get them to work with your glasses. Lots of glasses have very thin arms, and this makes the loops on the eyeglass chain slip off easily. Your eyeglasses get dropped. Scratched. Stepped on. Or lost, as the case may be. 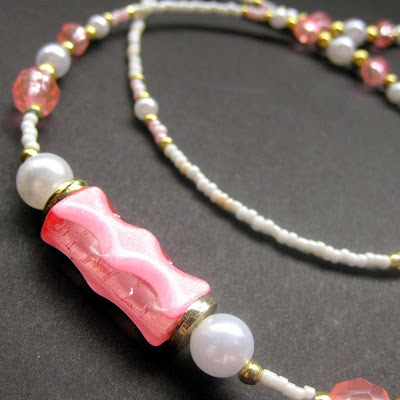 I make beaded eyeglass chains that are offered in my online shops both on Artfire and Etsy. In my experience, there are a number of people who love beaded eyeglass chains, but have this problem with the loops being too loose to hold their glasses in place. Fortunately, there's an easy fix to this problem that I'd love to share! All you need is some miniature rubber bands. You can find these bands in a variety of colors including black at a variety of locations including grocery stores, convenience stores, catch-all stores like Wal-Mart, dollar stores and more. I recommend using black, because the black will match the loop that holds on to your glasses and be nearly invisible to anyone looking. In this demonstration I show it done in yellow so you can easily see how it's done. This technique tightens the loop of the eyeglass chain so that it can easily grip the skinnier arms that many eyeglasses now have. At the same time, it's nearly invisible and so it keeps the eyeglass chain still fashionable and neat! I hope this helps those out there that love wearing pretty, beaded eyeglass chains but have always had a problem with getting them to work with your glasses. In our shop, not only do we make beaded eyeglass chains, but we accept custom orders as well! If you have a specific length you want, please don't hesitate to contact me for a custom order. It doesn't cost extra to adjust the length and I'm happy to do it at no extra charge on the eyeglass chains we have in stock as well as when creating new designs. Surprise Summer Sale at Bits n Beads by Gilliauna! Don't forget to use Coupon Code "boysofsummer"
With spring coming and the weather getting warmer, flowers are quickly becoming the theme of the new season. I was given the supplies to make a handful of these handmade bobby pins as a gift and after I made the first set, I liked them so much I decided to give them to a close friend of mine as a gift then order some more to make for myself! 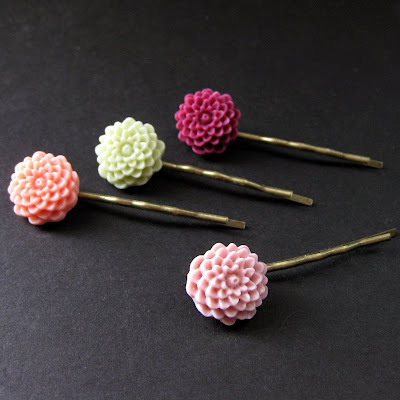 These flower hair pins are made from pretty resin flowers that look like little mums that have been adhered to a bobby pin base. There are so many wonderful ways to use these hair pins and it's a terrific and safe way to decorate your hair with flowers and color without losing them all over the place or worrying about them falling out. They would even be perfect for children or for accessories to incorporate into a wedding! I've always loved women that can pull off the wild side of jewelry and outfits with flair and style. I was inspired just the other day by one of them, in fact, that I saw on TV. I watch a lot of late night tv due to the hours I keep and I came across an episode of "Just Shoot Me" the other day where the character Nina Van Horne (played by Wendie Malick) was wearing an absolutely fabulous dress. At first glance, the dress looked black with a bit of feathered fluff at the cuffs. On closer inspection, though, it turned out to have a dark leopard print within the fabric. 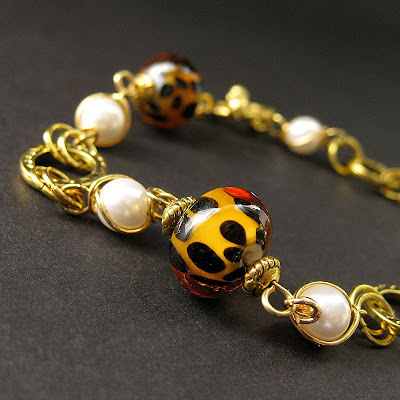 It was an amazing dress and it inspired me to create this wild but elegant leopard print bracelet made with handmade lampwork glass beads combined with a bunch of pearls I've hand-wrapped in gold tone wire then set interspersed with other golden accents. It's just amazing sometimes where inspiration can come from! In February, I attended a local historical reenactment gathering and tournament for the SCA (Society for Creative Anachronism). This group is a world-wide group of people who are dedicated to the research and re-creation of the arts and skills of pre-17th-century Europe. This includes many talents from combat and cooking to story telling, costume making, artwork and more. At the function that I attended, members dressed in the fashions and jewelry of the Middle Ages and Renaissance attended an all-day event that featured tournaments, a royal court complete with feast, dancing and other various reenactment activities. Many of the women who attended were dressed in Viking Era fashion, which included an interesting style of jewelry I was enthusiastic to start making. Above is one of the first of these designs. A Norse cascade necklace which is attached to the shoulders of an outer apron worn by the women of that era by large brooches. Look forward in future posts for more information on these cascade necklaces and other historical reenactment jewelry that I'm working on. I plan to add an entire line of such pieces to my repertoire of designs! Spring is a time of flowers and color and for spring, this year, I really wanted to learn how to make crystal flowers. Now, clearly from the picture it seems at first glance like it's not that hard a task, but it turns out that most of the tutorials I found were either rather complicated or far too embellished with fancy extras to do what I wanted. This flower is my success at designing my own personal method of creating crystal spring flowers. After hours of experimentation and many pricks from the wire (a few deep enough to make me bleed) I finally, successfully, came up with a simple way to bring the beads together into the flower design you see above. This flower is my first! It's designed with amethyst glass briolette crystals combined together to create shimmering petals. 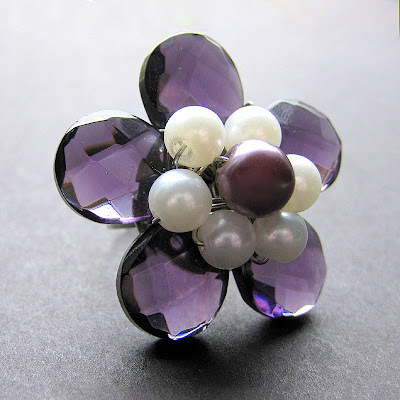 I then added white pearls and a plum colored pearl center before attaching it to an adjustable ring base that will fit size 7 and up. Agate is a variegated class of chalcedony that usually exhibits with colored bands or other markings. It is often used and worn in order to help transform and eliminate negativity as well as find a balance between the intellectual, physical and emotional centers of the body. 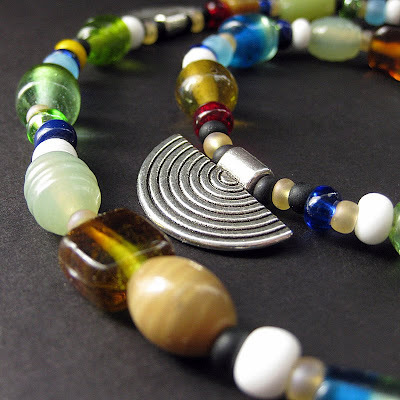 In the handmade gemstone necklace pictured in today's post, agate is the theme of the piece. The spider web agate used in this piece is both earthy and bold with a smoky shimmer to the body of the beads and dark bands of inky black within the stone. This spider web agate and bronze necklace has been created by hand from a large chunk of spider web agate designed into a pendant hanging from a hand-crafted chain of more spider web agate beads combined with fresh water pearls and lots of bronze tone accents. An extender chain at the nape makes the necklace able to be worn at a variety of lengths. 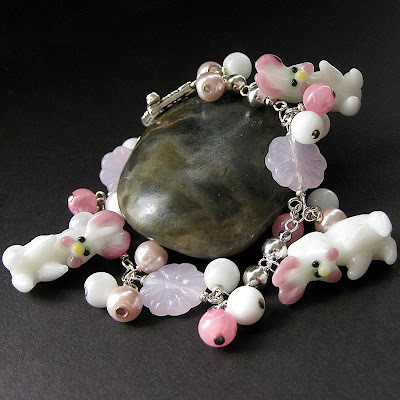 In celebration of the upcoming Easter holiday, I designed this lampwork Easter Bunny charm bracelet from a variety of beautiful pink and white beads clustered along the length of a silver plated chain with glass flower beads and lampwork Easter Bunny charms added in. This handmade charm bracelet is a perfect celebration of spring and a wonderful reminder of the traditions of Easter and the Easter Bunny from our past. The Easter Bunny is a character depicted as a rabbit bringing Easter eggs, who sometimes is depicted with clothes. In legend, the creature brings baskets filled with colored eggs, candy and sometimes also toys to the homes of children on the night before Easter. The Easter Bunny will either put the baskets in a designated place or hide them somewhere in the house or garden for the children to find when they wake up in the morning. The Easter Bunny was introduced to the United States by the German settlers who arrived in the Pennsylvania Dutch country during the 18th century. The arrival of the Osterhase (Easter Hare) was considered one of "childhood's greatest pleasures", similar to the arrival of Kris Kringle on Christmas Eve. According to the tradition, children would build brightly colored nests, often out of caps and bonnets, in secluded areas of their homes. 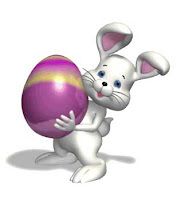 The "Osterhase" would, if the children had been good, lay brightly colored eggs in the nest. As the tradition spread, the nest has become the manufactured, modern Easter basket, and the placing of the nest in a secluded area has become the tradition of hiding baskets and eggs for children to find on their Easter Egg hunts. Sometimes when boredom strikes, you just need a little color to stir up the inspiration. When I was little, my sitter and I used to play a game. We would pick a color then take turns going through the alphabet naming something that was that color. For example, for purple we would start out with "A" and I'd say "Amethyst is purple" and she'd say "Barry's Beetle is purple". We'd take turns like that, going as fast as we can, until either one of us became stumped or got one wrong at which point the other party won. I had a lot of fun with it when I was little and now, as an adult, I sometimes find myself remembering fondly that game in particular when I'm working on my jewelry. The piece pictured above is the latest piece that has brought these memories to the surface. 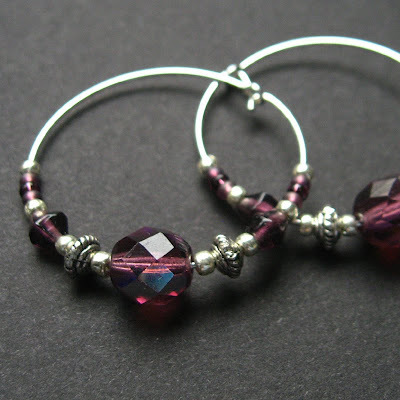 These silver and amethyst colored handmade hoop earrings are designed with lots of amethyst glass accents combined with subtle hints of silver accents. Joined together on a silver wire hoop, they create a mysterious style that makes me think of gypsies and moonlight. For centuries, ancient societies and individuals have believed that stones and crystals are gifts from the earth imbibed with magical powers to help with an individual's every day life as well as healing properties. Today, as then, they continue to be revered by many for these same properties and reasons. 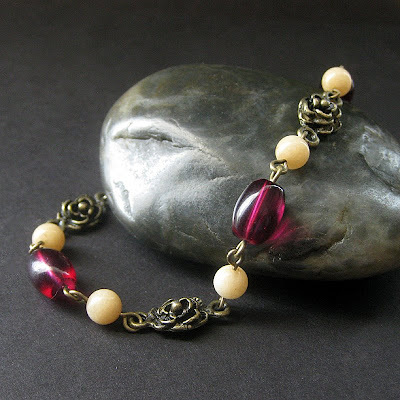 The handmade bracelet pictured above is designed with honey jade combined with burgundy glass beads and antiqued bronze rose charms. Honey jade is believed to be a stone of happiness and joy and has been used for centuries to foster these emotions as well as to encourage serenity and peace during times of need. Incorporated in this vintage-inspired bracelet, it adds a charming value to an artisan design that can be worn both casually or for dressier occasions. When I first started designing jewelry, I never imagined that I would be making handmade rings. To be honest, even when we opened our shops up on Artfire and Etsy, the thought still hadn't crossed my mind. 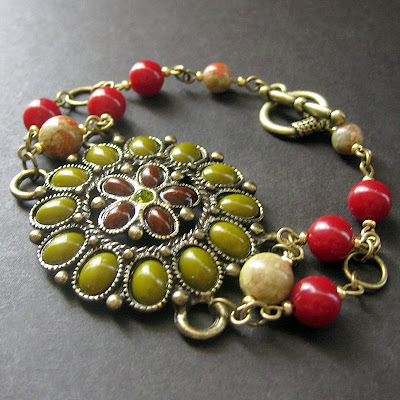 At that time, my focus was primarily on necklaces and bracelets. All that changed one day when a customer of mine made a suggestion for a custom order she wanted done. She asked if I ever made rings and that she'd like one made to her specifications. My first reaction was to say that I don't, but then after a pause I started thinking... why couldn't I? True, I'm not a metalsmith, but there are plenty of different kinds of rings out there and it's possible I could work out something that fit both my style of designs as well as my abilities. And so, after copious amounts of trial and error experimentation, the birth of a brand new and just starting collection of handmade cocktail rings was formed! 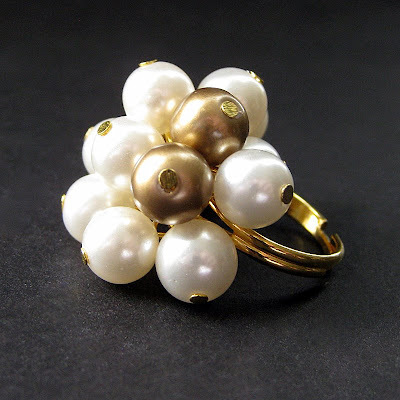 The one displayed here today is designed with creamy white pearls and a smattering of matte gold pears interspersed within, all set on a gold plated adjustable-size ring base. The Golden Evening handmade cocktail ring is elegant enough for formal attire but fun enough for casual as well and perfect for any day at all. The lesson? Try something new! You never know what you might come up with and it's an excellent chance to expand your horizons. 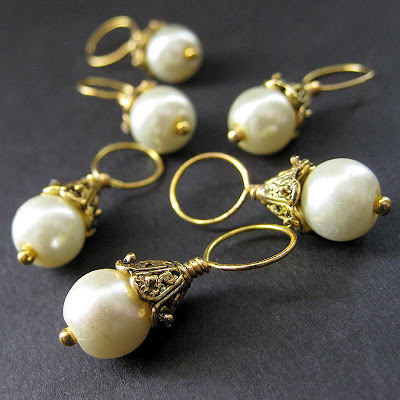 These pearl and gold stitch markers have been designed from creamy white glass pearls and intricately designed golden bead caps. The loop on the top is 8mm in diameter to ensure they'll fit most crochet hooks and knitting needles while the charm's is 24mm in total length. Stitch markers are one of the major wonders of the world to me. I have done a lot of research on them and their uses, but after all that, I still can't figure out how the person that uses them doesn't end up getting them stuck within their knit and crochet creations. I watched a woman at a craft fair who had bought a couple of handmade stitch markers from me, use them in her work, but as fascinating as it was I still couldn't grasp how she managed to get them in and then back out of the piece she was creating. The needles moved, the yarn entwined, the stitch markers slipped into place and down the line somehow slipped back out of place as well. Magic, I tell you. Pure magic. 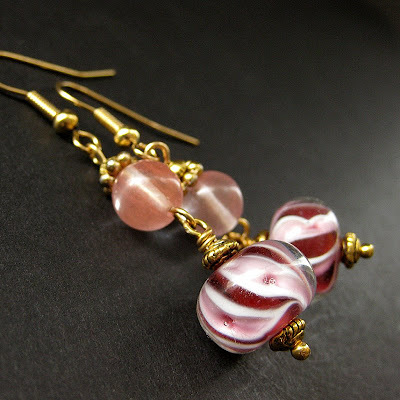 Made with lampwork glass beads with a swirl of raspberry and cream colors inside and a pair of cherry quartz gemstone rounds, these handmade earrings were handmade in a fun and eye catching style with just a hint of elegance and warmth with delicate gold-plated accents. These lampwork glass and gemstone earrings measure at 2.25-inches (5.8 cm) in length with a touch of weight to them from the lampwork glass, but they are designed to be easy to wear and will make a fun accent to any outfit that they're chosen to pair off with! 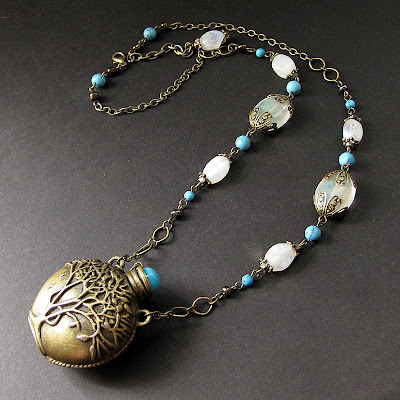 I love the bronze Tree of Life bottle used in this moonstone and turquoise necklace. When I first saw it, I was immediately inspired and the design took on a life of its own. It almost felt as if it created itself at the tips of my fingers. 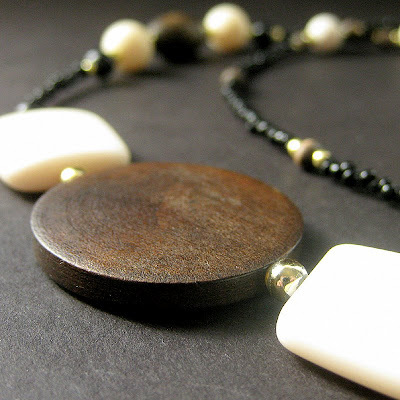 The bottle at the end of this handmade artisan necklace is fully functional with a cap that opens but is securely chained to dangle when the bottle is open instead of getting lost. Along the chain, interspersed between lots of bronze accents, are large and medium sized rainbow moonstones combined with magnasite turquoise rounds. This Tree of Life necklace is then finished with an extension chain at the nape so that it can be worn at a variety of lengths. Fun and cute... and perfect for someone with a sweet tooth! 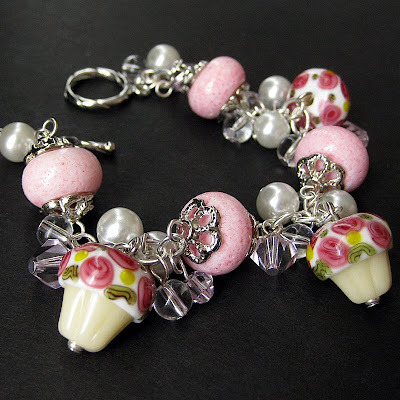 This handmade charm bracelet was inspired by pink dyed coral beads that look like candy. The coral beads were used as spacers between sparkling clusters of crystals and glass beads. Completing the piece, a handful of cute little lampwork glass cupcake charms with vanilla frosting and little pink rosettes were added. These cupcakes are handmade from lampwork glass and an adorable addition to the sweet tooth theme. This handmade cupcake bracelet was then finished off with a toggle clasp in matching silver tones that looks like twists of licorice! Spring is coming and summer isn't' far behind... at least we all hope that's the case! With thoughts of a warm spring and the beginnings of summer rolling around in my head as inspiration, this handmade sunflower necklace has been created in anticipation of that soon-to-be-arriving season. The pendant at the end of this artisan necklace is a beautiful porcelain cabochon that has been set within a frame of leafy bronze fronds. 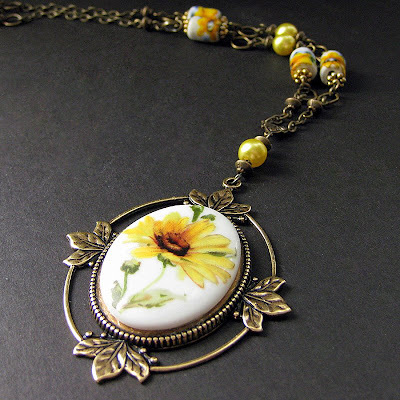 The pendant is 70 mm in size and dangles at the end of a length of hand-created chain with bits of bronze beads, yellow pearls and matching porcelain beads with sunflowers on their surface. A light weight alternative to losing your glasses! Wearing them around the neck easily helps keep track of reading glasses that can easily get lost and in this handmade eyeglass holder you get a splash of feminine color and a touch of shimmer as well. 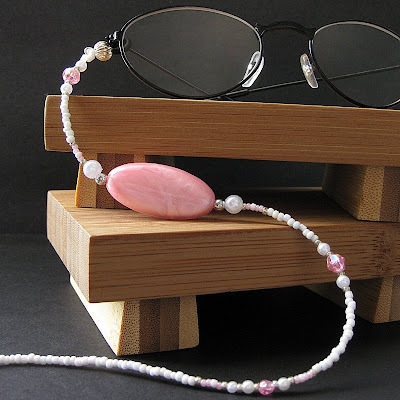 Made with acrylic beads in a sweet and vibrant shade of candy pink combined on a strand of white seed beads and small smattering of white pearls, this beaded eyeglass holder is a perfect accessory for dressing up a pair of glasses and keeping them from running away at the same time. My grandmother used to always loose her place in her bible, which she read ever day. She used to stick tons of different miscellaneous on-hand things in the pages to save her place from receipts to scraps of trash to pencils and more. Until I made her a bookmark just for her bible. From that day forward, she always had something special just for her bible and she loved it. 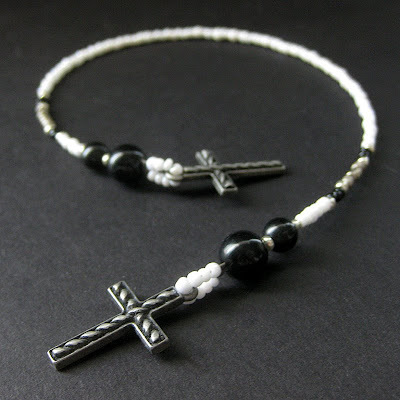 In the spirit of that memory, this beaded christian bookmark was designed from black and white beads for a minimalist look with a touch of elegance, a pretty pewter cross then set to dangle from either end. Perfect for not just bibles but books, datebooks, journals and more, this handmade 11.75-inch (30 cm) beaded book thong is sure to mark any reader's place with a touch of style and bit of faith. Inspired by beads with intricate geometric shapes over their surface, this handmade artisan bracelet is created around those beautiful rectangular beads combined with vibrant turquoise beads and a large elliptical turquoise bead at the front. 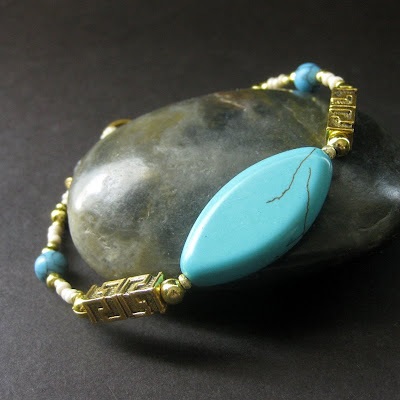 All together this turquoise handmade bracelet with golden accents is designed to create a feel of ancient mystery and luxurious style. The bracelet measures 8-inches in length so that it can fit most wrists and has been designed to add a splash of fun and color to any outfit whether casual or something more elegant! When I started working with these bead wafers, they reminded me of church. At first, I wasn't sure why, but then it struck me that they're a very similar size and weight a the host that's given in church during Holy Communion. That is how this handmade eyeglass holder became titled "The Host" once it was finished! 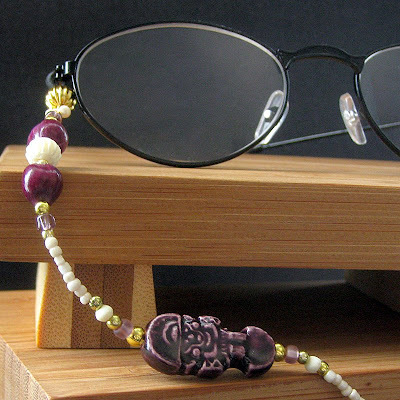 Designed with wooden wafers combined with unusually shaped cream wafers and other dark wood and cream beads, this beaded eyeglass holder is perfect for holding on to reading glasses that usually like to try and make a run for it and get lost. The dark wood and cream colors are accented by touches of golden shimmer that adds a bit of warmth to the design. One of my absolute favorites of late! 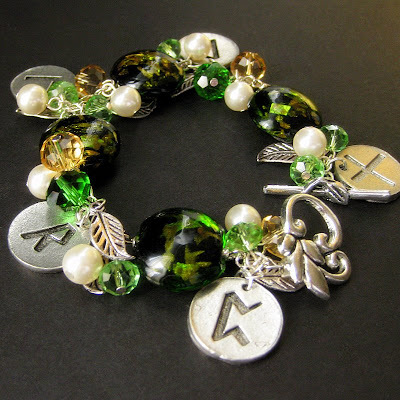 Titled the "Forest Runes" charm bracelet, this piece is designed from beautiful puffy lampwork coin beads interspersed between shimmering clusters of beads and charms. Each cluster contains the soft glow of pearls combined with the bright shimmer of crystal glass beads in shades of green and tan. Included as well are little leaf charms and a coin shaped rune set in the center of each cluster. This handmade charm bracelet is then brought together with a beautiful leaf-embellished toggle clasp and the entire piece measures at 8.25-inches (21 cm) in length. 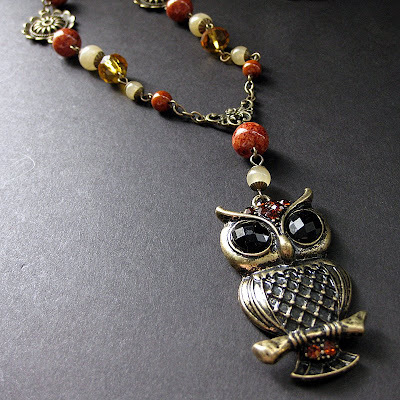 A beautifully made 52mm bronze owl with black rhinestone eyes and the shimmer of rust colored rhinestones at his crest and tail dangles at the end of this handmade gemstone necklace designed from rust red fossil stones, honey jade gemstones and lots of little bronze accents including floral charms and bead caps. This handmade owl necklace is both earthy and elegant with a touch of shimmer and lots of rich color. It's sure to be a favorite to owl lovers everywhere! The necklace's length is adjustable between 19.5" - 21.5" in length (49.5 cm - 54.6 cm) thanks to an extender chain at the nape and lobster claw clasp. Delicate and colorful with a vintage style flair! These handmade earrings are created from pretty little glass turquoise beads faceted for a cheerful shimmer combined with bronze accents. 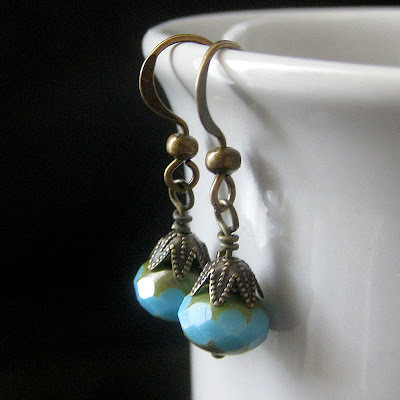 the little delicate dangle earrings have then been set to hang from matching bronze tone earring hooks. The earrings are not just fun and colorful but light weight and easy to wear. Sometimes you just need a little girly goodness and femininity. And that's what this beaded badge holder in cotton candy pink is all about! Beaded in cotton candy pink beads combined with a touch of white pearls and shimmer of golden accents, this handmade badge lanyard is perfect for keeping track of your badge and adding a little flair and style to a work outfit, school uniform and many other ideas and uses! It can even be adjusted and have a magnetic clasp added so it can be worn by nurses! I wish I could find more of these!! That's what I thought when I found this little pewter and rhinestone elephant charm. I fell in love with him right away but was only able to find two. I then used one for a custom order and this one is all that's left! 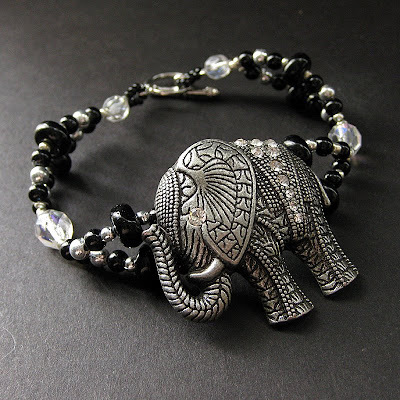 Using this beautifully detailed elephant charm, I've designed a handmade elephant bracelet created with shimmering crystal beads and black glass beads. This bracelet is both fun and elegant too and I love the way it sparkles and shines! 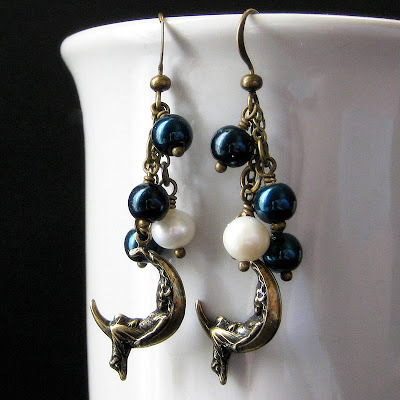 Bronze charms depicting delicate dozing ladies swinging within the curve of thin crescent moons dangle at the end of these handmade pearl earrings. Above the celestial moon charms in bronze dangle a cluster of glass pearls in midnight blue with one freshwater pearl in each cluster. These pearl cluster earrings were designed to match the "Swinging Moon and Midnight Pearl" necklace recently made in matching midnight blue pearls, soft white pearls and bronze accents. I love incorporating vintage components into my jewelry designs and other creations. I spend hours visiting estate sales, garage sales, flea markets and thrift shops searching for vintage pieces with the perfect beads I need for an idea or other components that I can recycle and use. 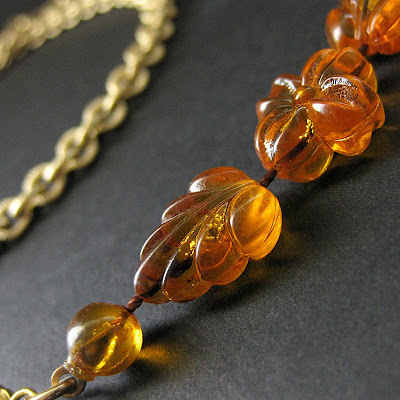 This handmade eyeglass chain is a wonderful example of what can be done with a bit of vintage tucked away in the corner of an estate sale jewelry box. Once a necklace of amber colored leaves and gold plated chain, that necklace has been taken apart, cleaned, refurbished and recycled into a colorful eyeglass chain that's both light weight and stylish at the same time! Designed as part of the "Northern Lights in a Midnight Sky" jewelry set, this handmade artisan necklace is created under the inspiration of the Aurora Borealis (aka Northern Lights) and their beautiful display in the arctic sky. 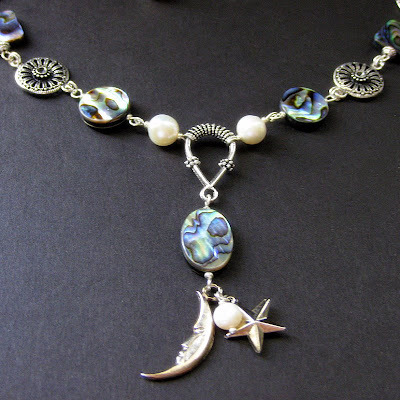 Created with moon and star charms dangling with a freshwater pearl, this abalone and pearl necklace is designed with a combination of antiqued silver accents combined with fresh water pearls and paua abalone shells representing splashes of color in a night sky. If you like this piece, you may also enjoy taking a peek at the abalone shell charm bracelet and matching abalone and pearl earrings that complete the set! Adding to the Aurora Borealis inspired "Northern Lights in a Midnight Sky" set I started to share with readers yesterday, this handmade abalone charm bracelet is designed from colorful shimmering abalone shells that have been combined with genuine freshwater pearls and lots of little silver celestial charms. 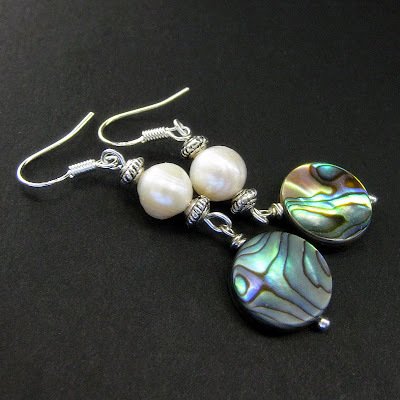 Yesterday I shared with you the abalone shell and pearl earrings that match this handmade bracelet. 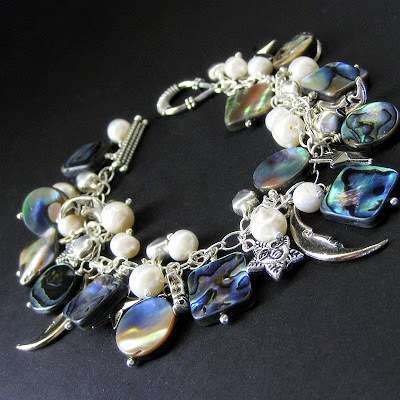 In this handmade artisan pearl and abalone bracelet, moon and star charms combine with other silver accents and the cheerful chime of small silver bells for a mystical night sky effect with the colorful shimmer of paua abalone shells representing the beautiful light display that the Northern Lights cast upon the sky above the arctic. This is the second piece in a three piece set that I'm featuring this week titled the "Northern Lights in a Midnight Sky" jewelry set. The Aurora Borealis (aka. the Northern Lights) is a gorgeous natural light display that is observed within the night sky located over the northern polar region of the earth that's caused by the collision of charged particles directed by the Earth's magnetic field. Inspired by the Northern Lights, this pair of handmade abalone shell earrings are designed with paua abalone shell disks dangling beneath genuine freshwater pearls. Sterling silver completes the piece and this is part of an entire set entitled the "Northern Lights in a Midnight Sky" jewelry set. I'll be featuring the necklace and bracelet in this set later on as well! 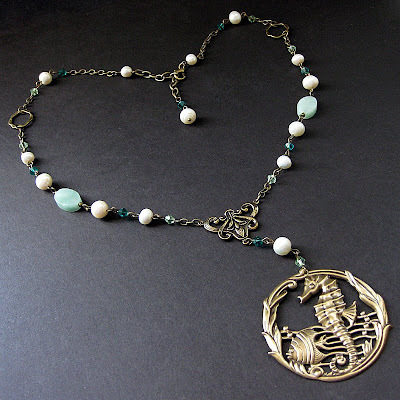 A bronze pendant with sea life motif including seahorse and angel fish is the focus of this handmade aquatic themed necklace. Designed with a combination of genuine fresh water pearls, aqua colored amazonite gemstones and crystal beads in aqua and teal this necklace has an extender chain at the nape for an adjustable length and lots of little bronze accents. Each link in this handmade beaded necklace has been hand turned with special care towards quality and workmanship. The clear globe beads with golden flake filling their insides instantly inspired me to design something elegant the moment I saw them. Used here combined with midnight blue pearls, lighter blue glass accents and a bit of gold and white, the globes are set to shimmer and dance along the strand of this beaded lanyard for both an elegant style and useful purpose. This handmade badge lanyard is designed to be worn around the neck with a badge clip or key ring located at the end to keep badges for work, volunteering, school and more easily in reach. So many different venues now require wearing a badge and here's a way to do that without giving up personal style! The moment I saw this pendant I was immediately inspired and when I ordered it, I couldn't wait for it to arrive so that I could work with it. 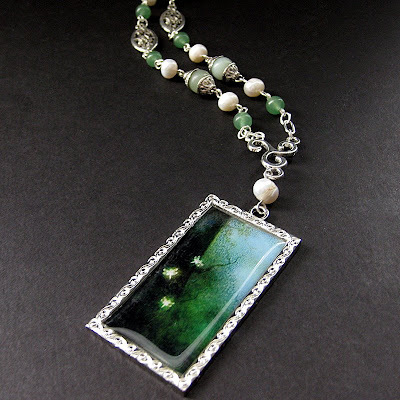 Made from mint green jade gemstones and the rich, soft glow of fresh water pearls, this handmade gemstone necklace is designed around the beautiful forest themed pendant that dangles at it's end with dancing fireflies against a rich green backdrop. The finished jade necklace is designed with spiral swirl accents to match the frame of the pendant and is then finished with an extension chain at the nape to allow the necklace to be worn at a variety of lengths for comfort. Made with delicate glass teardrops in a rich amber color, these wire wrapped earrings are a colorful and understated accent when worn. The glass teardrops started out in a shade of crystal clear amber and were soaked in a glass clouding solution for a smooth satin finish. 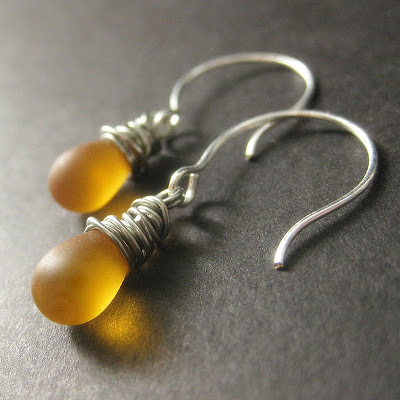 Once the finish was just right, they were thoroughly cleaned then carefully wrapped in silver tone wire for contrast between warm and cool tones then set to dangle on matching handmade earring hooks. This pair of handmade teardrop earrings is part of an extensive collection titled "The Elixirs" which come in a variety of colors both in shimmering clear tones as well as in the clouded satin finish you see pictured here. Every pair is completed with care from their wire wrapped tops to their carefully shaped earring wires. 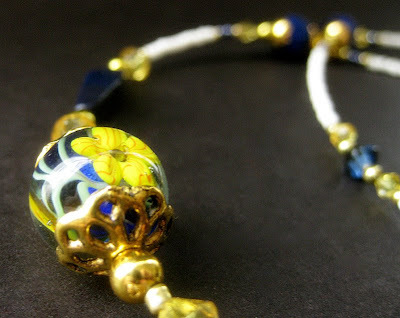 A sea of cobalt blue with bright yellow flowers floating within it is the theme of the floral lampwork beads that are included in this handmade eyeglass holder. 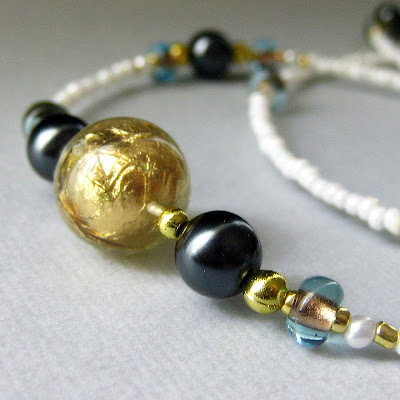 These beads aren't just the theme, they were the inspiration for this beaded eyeglass holder made from matching cobalt and navy beads combined with touches of yellow and lots of gold tone shimmer interspersed along a beaded white strand. When I saw this little 21mm pocket watch, I instantly fell in love with the little owl on the cover. I was impressed with all of the beautiful intricate details on the face of the watch as well as the floral motif on its back. I've paired the pocket watch up with lots of matching bronze accents in this handmade gemstone necklace, adding in bits of earthy green lace agate stones and honey jade gemstone highlights for a uniquely elegant look that's an excellent alternative to wearing a watch. 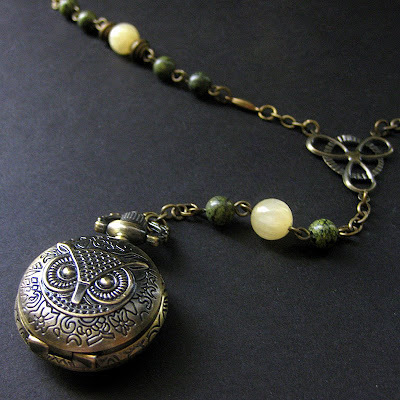 The length of this owl pocket watch necklace is also adjustable! The nape has been made with an extender chain that the clasp can connect to in order to wear the necklace at a variety of lengths. Unakite gemstones are combined with rich red beads and lots of bronze accents in this handmade artisan bracelet. A large bronze floral piece with inlayed stones and rhinestones then finishes it off, a toggle clasp added to keep it securely around the wrist. This unakite gemstone bracelet is titled "The Pocahontas Flower" because of the earthy elegance of the style from the large floral center piece to it's earthy beaded accents and gemstones. Eyeballs! Yep, that's my new theme. It's titled the "I've Got My Eye On You" and comes in a variety of colors from "Jaundice Yellow" to "Jealous Green" and a handful of others. Okay, so I admit that my new theme is a little weird and quirky. But, when I saw these odd eyeball-like glass beads I just couldn't resist! 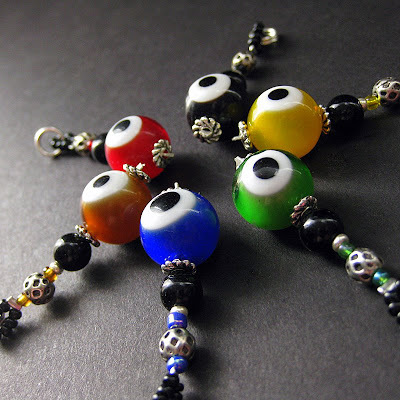 Made in six different colors, these glass eyeball charms are great and maybe just a tiny bit creepy, created from glass eyeball beads that dangle from beneath a beaded tassel of matching beads and a touch of silver and black. These handmade charms are great for a variety of uses from wallet charms to cellphone charms as well as car mirror dangles, beaded zipper pulls and many more ideas! I was recently invited to join a group of sellers on Etsy called the "Prayers on a Wire Team". One of the activities of this team is that they hold seasonal contests. 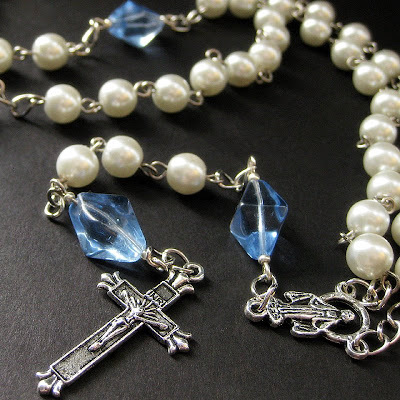 The contest for the winter season is "Jack Frost" and it was that theme that inspired this handmade pearl rosary. Made from snowy white glass pearls as the Aves beads and pale blue glass diamond shaped beads for the Paters, this handmade rosary is titled "Winterlight" with a soft winter glow theme and finished off with an antiqued silver tone Our Lady of the Miraculous medal centerpiece and a detailed silver plated crucifix at the end. Designed with a vintage feel and romantic Victorian theme, this handmade artisan necklace is created from the soft glow of pink pearls combined with rose quartz gemstones and bronze accents. 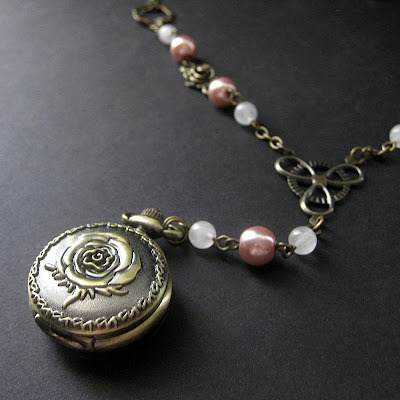 Included are delicately carved bronze rose charms and lots of little details combined with a fully-functional pocket watch pendant dangling at the end with a rose featured on it's case. This pocket watch necklace is designed with an extender chain at the nape so it can also be worn at a variety of lengths, making it adjustable with length to play with for a perfect fit. Delicate and sweet, these handmade floral earrings are made with the iridescent glow of satin white flowers dangling between vibrant blue beads. Lots of bronze accents and flowery bits transform these earrings into a set that can be worn both with an elegant ensemble or something simple and casual. 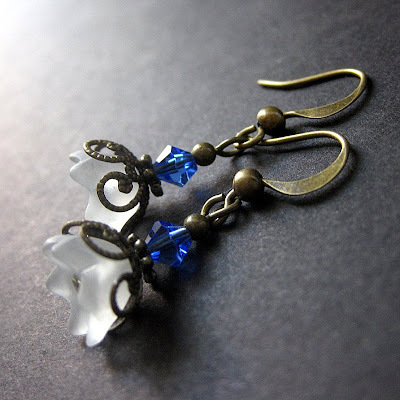 These handmade earrings were so pretty and feminine, I actually made an extra pair so I could keep a pair for myself! Fun and earthy at the same time, this handmade eyeglass chain is beaded with carved bone beads and dried cherry pit beads that have been dyed a rich purple color to match the glaze on a pair of ceramic Tiki statue beads that dangle on either side. This fully beaded eyeglass chain is perfect for showing off a fun nature and love for color while helping leash in reading glasses that always seem to go missing when you need them most. Fun and flirty and full of color! 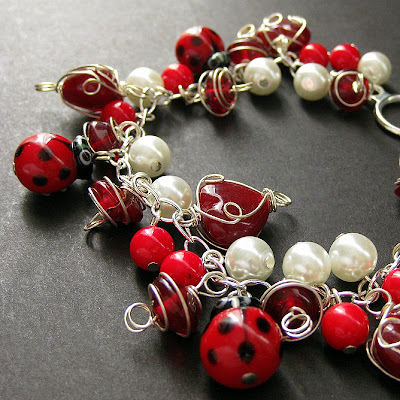 This handmade charm bracelet is designed using wire wrapped red glass beads, glass pearls and red coral beads all joined together on a silver plated chain with beautifully made lampwork ladybug charms. Whether considered as a beautiful and fun Valentines gift or just for every day, this ladybug charm bracelet is beautiful and made with a combination of red and white for a vibrant statement. And I've also created earrings to match! 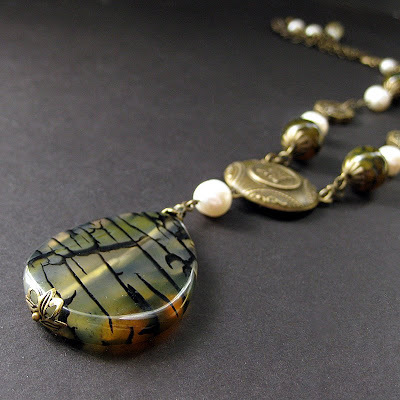 Inspired by the work of the artist Alphonese Mucha, this handmade art nouveau style necklace is created from navy beads and a touch of earthy tones with ceramic beads combined into the design. At the end of this handmade beaded necklace, an art nouveau style pendant featuring a woman smelling flowers dangles beneath a matching style center. 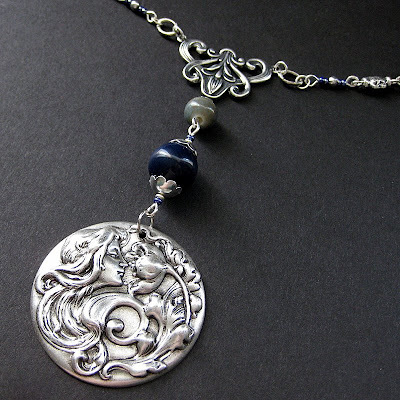 Even the chain on this necklace is handmade for a unique look and style with links of silver charms connected to beaded links in silver and navy blue. The length is adjustable as well, featuring an extender chain at the nape and lobster claw clasp to attach to it. I have a variety of family members who absolutely love going to the casino now and then. It's a form of recreation to them. Some play the slots and others visit the tables, but it's something they enjoy a great deal. 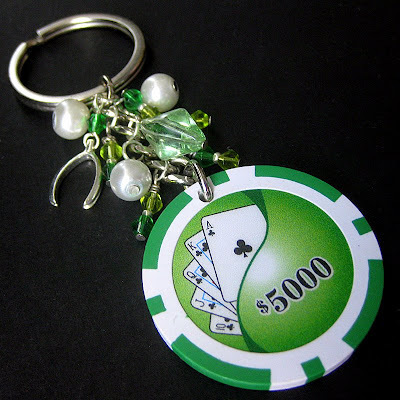 With these loved ones in mind, I've designed this beaded good luck charm created from a green $5000 poker chip and a cluster of green glass beads combined with a little silver tone wishbone charm. This charm doesn't just come in green either, but in a variety of colors from green to red, blue to black.